Body image is a persistent and intensifying concern for young people and new approaches are urgently needed to address this significant health and well-being issue. By listening to young people's ways of tackling problems, Dr Julia Coffey is advancing our sociological understanding of body image and health. Julia’s research highlights the importance of the body in young people’s lives. Young people’s body image is formed against the backdrop of increasingly intense social and cultural pressures regarding bodily appearance. Julia explains that sociological approaches are important in addressing the social dimensions of the issue, with key factors of consumer culture, development of new lifestyles, and an emphasis on crafting a fit, beautiful body as vital for understanding the heightened significance of the body in western societies such as Australia. Julia, a member of the Newcastle Youth Studies Group, has contributed significantly to the sociology of youth and health by advancing our understanding of how young bodies are produced in relation to socio-cultural contexts. These issues are the focus of her recently published books, Body Work: Youth, Gender and Health in Routledge’s Youth and Young Adulthood Series, and Learning Bodies: The Body in Youth and Childhood Studies, co-edited with University of Birmingham’s Shelley Budgeon and University of Melbourne’s Helen Cahill. Her empirical studies engage cutting-edge concepts and perspectives on the body, gender and identity to understand the body as actively produced through affective relations, rather than a passive object upon which social and cultural meanings are inscribed. Through her research she aims to uncover how young people negotiate their identities and the world to find ways of supporting their health and wellbeing. "I believe that young people are experts in their own issues and wellbeing," Julia said. "I am trying to change the perspective that people often have of young people. They have a lot of knowledge and expertise around how to address the problems they face, and this research can inform policy that will make a real difference to their health." Julia has applied her expertise to issues relating to youth, the body and gender to inform understandings of steroid use, cosmetic surgery, exercise and diet, health, and appearance pressure for young women and men. Her 2012 PhD at the University of Melbourne explored ‘body work’ practices in young people – how they change their appearance in ways ranging from diet and exercise to surgery and taking steroids in order to influence how they are perceived in the world. These themes are the focus of her book, Body Work: Youth, Gender and Health (Routledge, 2016). “While their body work ranged from the mundane to the extreme, what was common in both genders was that young people felt these practices were important in order to maintain their identity – and that stopping them would entail a loss of self,” Julia explained. "Body image is one of the top three concerns of young people in Australia, for both young women and men. But people negotiate body image at a range of different levels. “By understanding how bodies are thought of and lived by young people, we can better understand the pressures that are leading to this increasing anxiety, in both genders, about the body." Her post-doctoral work has involved a range of research projects related to the health and wellbeing of young people, including the Learning Partnerships Project, an education project using high school students to role play issues around help seeking to train student teachers and doctors. The project has been highly successful in promoting student wellbeing in Melbourne and it’s hoped it will be developed into a national resource. In addition, Julia has worked on a UNESCO curriculum and training program that targets key populations vulnerable to HIV in South Asia and the Pacific by training young people to deliver information to their own groups. 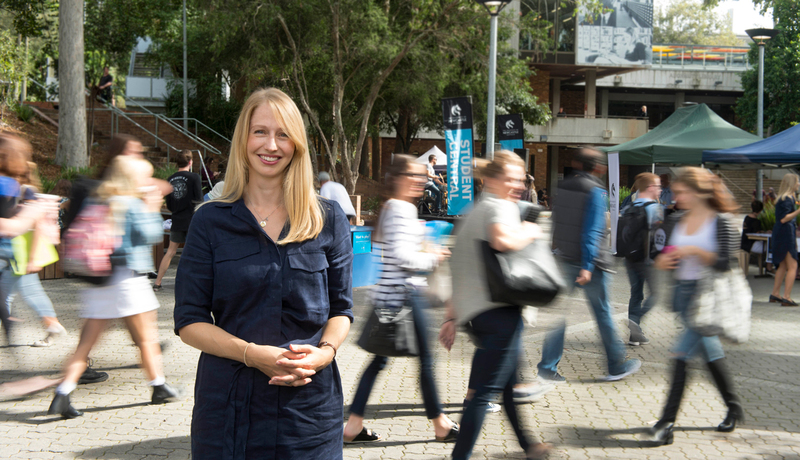 In 2015, Julia was awarded the University of Newcastle Vice Chancellor’s Early Career Researcher of the Year, and Research Excellence and Innovation Awards. She was also awarded an International Visiting Fellowship to host Professor Jessica Ringrose, from University College London, UK. This Fellowship is a significant collaboration with an internationally renowned researcher in gender and education including young people’s digital sexual cultures, which encompasses issues such as ‘sexting’ and cyberbullying. Ringrose is a member of the Institute of Education, London; the world’s leading centre for education and applied social sciences, which currently ranked number one for education worldwide. In collaboration with Helen Cahill and researchers from the Youth Research Centre, University of Melbourne, Julia and Ringrose are working to refine new participatory arts­-based research methods for investigating young people’s perceptions of the influences on their gender identity, body image and body work practices. “Poor body image is debilitating and can significantly impact on an individual’s capacity to participate fully in society,” Julia said.